A show like no other, where the world of fairytales and board games collide and the audience... become the show. With the pomp, ceremony and status games of the Royal Court, three characters from an over sized chess board come to life to conduct an interactive board game. A bossy Queen, a stupid knight and a pawn with a touch of cunning, conduct an absurd and humorous game for all ages, where the aim is to trust your creative instincts. But beware the Queen, for it is with her that all power resides.The only way to discover the game is…… to play it? The Curious Game is a predominantly non-verbal performance that uses archetypal characters. Using symbols and gesture, The Curious Game challenges the audience to become participants and interpret the Queen’s signs without discussion, by thinking laterally and acting physically. The Curious Game is physical, visually engaging and highly interactive. Each performance a unique experience influenced by the participating audience and their ability to be creative and trust their own instincts. 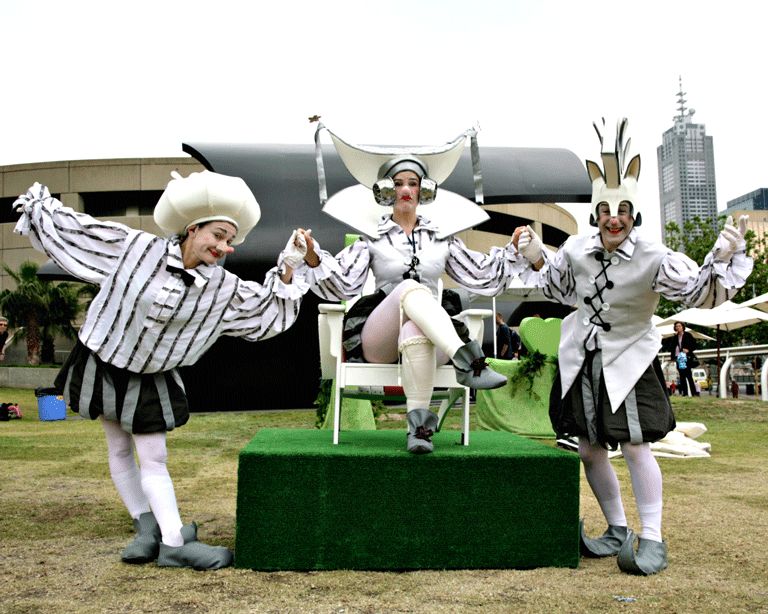 Commissioned by The Arts Centre Melbourne, The Curious Game has delighted audiences from New Zealand to South Korea utilising Born in a Taxi's signature performance style incorporating physical theatre, ensemble dance, clowning and audience participation.